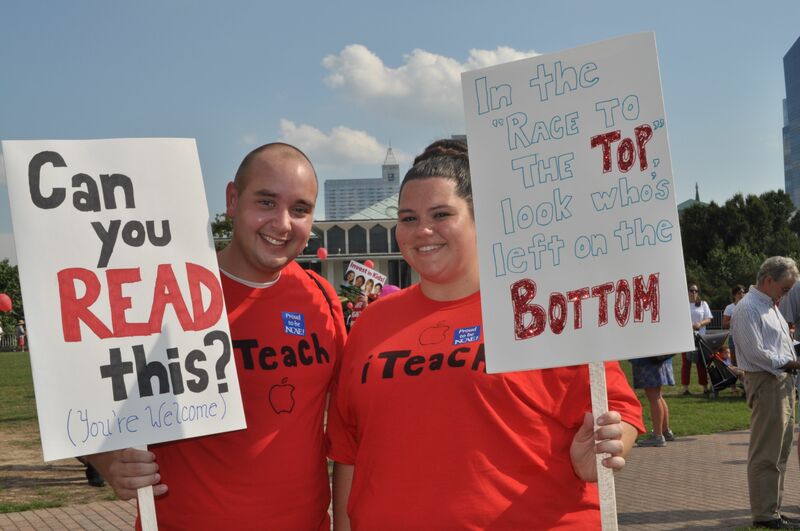 Frankie Santoro and his friend, Sara Thompson, are both public school teachers in Forsyth County. “Without a doubt, we are both thinking of leaving the state. 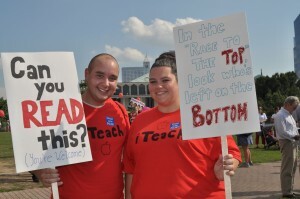 And we believe there will be a mass exodus of teachers from North Carolina,” said Santoro. That forecast was easily the most popular sentiment I heard as I walked the crowds last night at the 13th Moral Monday, where an estimated 10,000 people converged on Raleigh to raise their voices in protest against the cuts lawmakers have made against public education. No raises for abysmally paid teachers, the loss of tenure, a dearth of instructional supplies, and the introduction of school vouchers, along with many other cuts all have educators feeling that their profession is under attack. The loss of supplemental pay for obtaining a master’s degree was another flashpoint for many. One teacher in Wake County, who didn’t want to be named for fear of retaliation, is in the middle of a master’s degree program. “I just emailed my advisor to see if I could speed up graduation. It’s very disappointing. My master’s degree program has given me so much insight into teaching, but now it doesn’t matter anymore. It means nothing more than a bachelor’s degree at this point, “she said. Nicholas Nostro is an elementary school teacher at Pitts School Road Elementary in Cabarrus County. 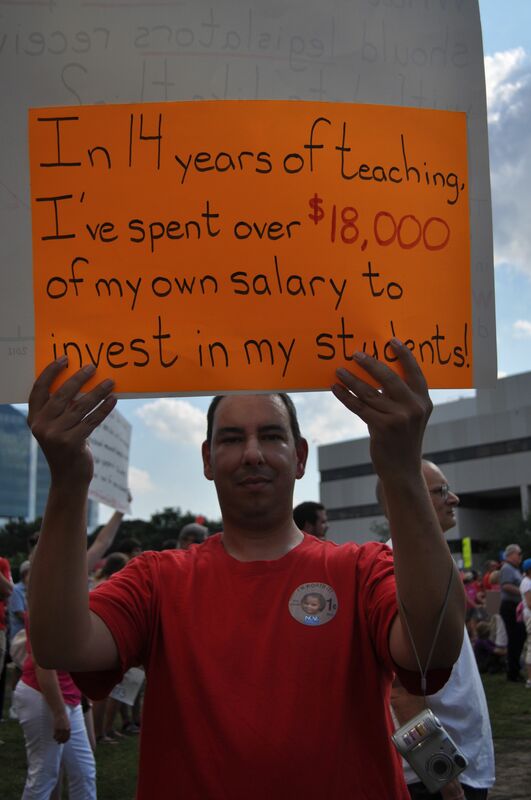 He held up a sign that said over the past 14 years, he has spent more than $18,000 of his own money for his students. A middle school teacher from Chapel Hill, who also did not want to be identified for fear of retaliation, said she planned to leave the state. “This continued lack of raises for teachers for the past six, now seven years, means that I basically have to leave the state. I can’t afford to teach here,” she said. Where will you go, I asked. Later I met Carly Deal, who is currently an NC Teaching Fellow at UNC Wilmington. Deal said she is in the last cohort, unless something changes. The 2013-15 budget calls for defunding the NC Teaching Fellows program and moving that money into a line item intended for Teach for America. “I’m so proud to be a part of this program, and I am really sad that other college students won’t be able to take advantage of it,” Deal said. I asked Deal what she would say to Gov. McCrory or her local lawmakers about the education cuts in the budget. As I walked away from the legislative building with the marchers, photographing more signs with phrases like “In the Race to the Bottom, There Are No Winners” and “Who will invest in NC if NC does not invest in its future,” I turned away to go home and came upon one man on a corner, quietly standing and waiting for the street light to turn green. That educators are considering retiring or seeking to teach in states where their contributions are more valued than by the citizens of NC as reflected by the NCGA, this plays into the Ultimate Solution of the GOP to destroy public education. Without good teachers, schools will fail. When schools fail, GOP supporters open the floodgates for more charter schools who have no supervision or accountability. At some point, the wealthy families have their kids in the ultimate of educational environments, all paid for by the citizens of NC. The GOP hates an informed, educated electorate that can see through their BS. 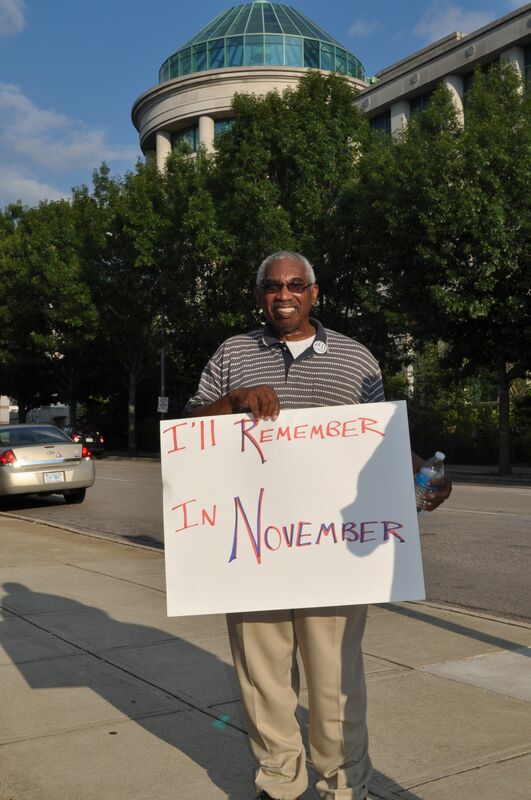 I, too, will remember in November. That is funny, wonder if there were any math teachers making the counts. I guess liberal/progresso math means 1+1 equals what 7? Take actual attendance of 1,500 and multipy by 7, round down to a feel good number of 10,000. Way to go educrats! It is also funny to zoom in on these pictures and note all the empty space with crickets chirping in the background. I asked a teacher I know about the non raise for advanced degrees, she was livid. I then asked if she agreed with paying better teachers more rather than increased pay for teachers who happen to have been around along time, she agreed with that part. I then asked her if she thought getting an advanced degree would make her a better teacher, she said it would. Voila, advanced degree, better teacher, better pay. What is the issue again? I would suggest somewhere in the north like Vermont or Maine. They are nice states and look so nice in autumn. My spouse went back to school in NC to fulfill his dream of teaching and became a certified middle school math teacher. The salary wasn’t an issue, it was his calling. He student taught at a poor, rural, mostly minority school where they let kids shower while they washed their clothes and had weekly meetings about the kids in foster care. There were some kids collecting food from classmates to take home for siblings. In one six week session, he raised their average test scores by 18 points. A week later, they told the college to find him a different school to finish his student teaching and was black-balled by those tenured teachers that he out-shone. Not all teachers are heros, not all should be protected. Somewhere up North eh? How about Detroit? I hear all of that liberal bull worked out well for them. Don’t let the door hit you in the……….. 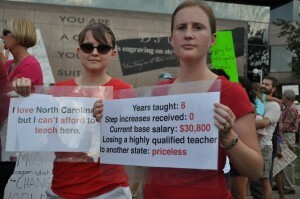 I am wondering how many times the “Teachers” marched on Raleigh when the Democrats were the majority in the NCGA. I don’t recall a single instance. In the years prior to 2010 and the first GOP majorites, how many pay raises were given to the teachers? I support giving teachers pay raises. I’d like one myself too, but I haven’t had one or a vacation since 2008. I pay taxes like the teachers do too. Every one is in the same economic boat — going no where fast. 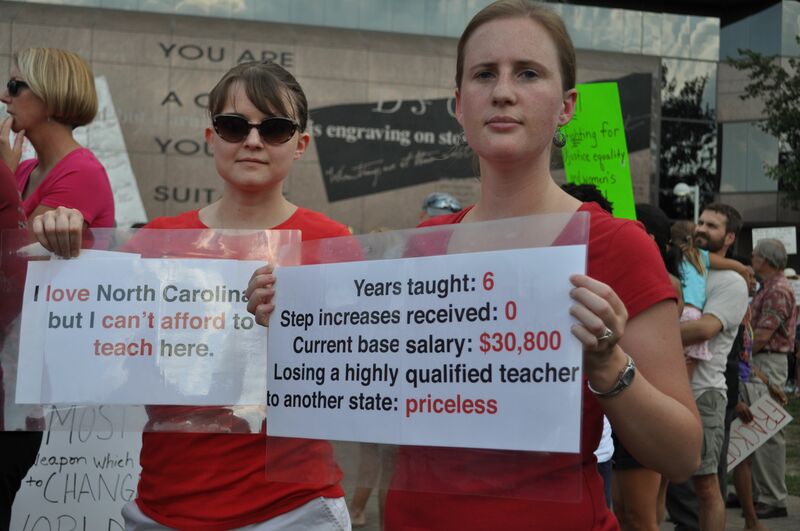 The point I wish to make is that teachers and their union/association is viewed as a leg of the NC Democratic Party. Being so political as pushed teachers into a corner where views and needs become part of the battle of wills between the political parties. Teachers need to become apolitical or at least non-partisan. The GOP is now the majority — spiting in their face is no way to make friends. Dump the NCAE and start a new association without the partisan ties. Before I left Michigan, a local school district put out 2 help-wanted ads for early-El teachers. They got 600+ qualified resumes (teaching cert, college degree, etc). So, yeah, I’m suuuuurrrreee that teachers will leave for “up north”. Cause, you know, they can compete against 600 other candidates. Second, I thought that teachers didn’t do this for the money? Third, teachers told me that “we could make more money if we did something else” in the relatively high-paid state of Michigan (where some of y’all wanna go). So I issues a public challenge, in the press and announced LOUDLY at a MEA union rally, that I would give $1000 to any teacher who got a written job offer for more money. Three months later (when summer break ended) I bought a $1000 bike instead. Cause, you know, I wanted to test the hypotheses, like a teacher told me to do? So cut the rhetoric. It’s not working anymore, if it ever did. The GOVERNOR should outlaw Teacher UNIONS next,they have more excuses for failure than golfers.PS;#2 pencil and paper works really good. college educated people can choose what and where they want to work,so don’t expect the taxpayers to fulfil your expectations.